Opus-HRF built and marketed a unique fun car from 1966 until 1972, the Opus. The Opus was essentially a scaled down copy of an American Model T Hot Rod, produced in the style of a "T-Bucket". 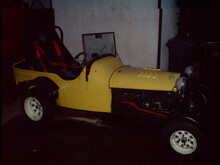 This clever design meant that it only need a small open body-tub which featured a large flat windscreen and no bonnet! An impressive 250 examples of the Opus had been produced by the time building ended in 1972.